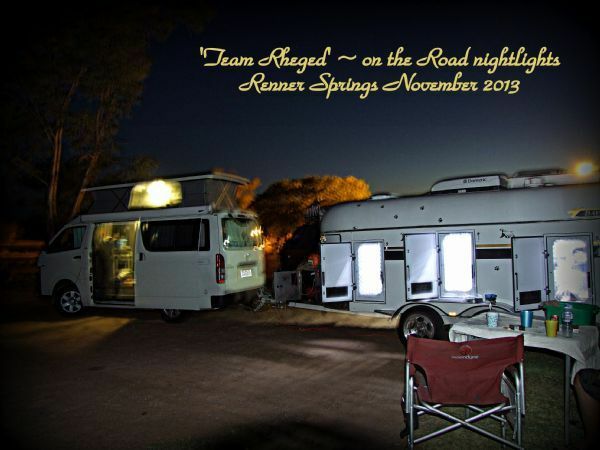 Camping under out under the 'Southern Cross' in the Australian Outback ~ something 'Team Rheged' does often. We consider ourselves very lucky indeed. 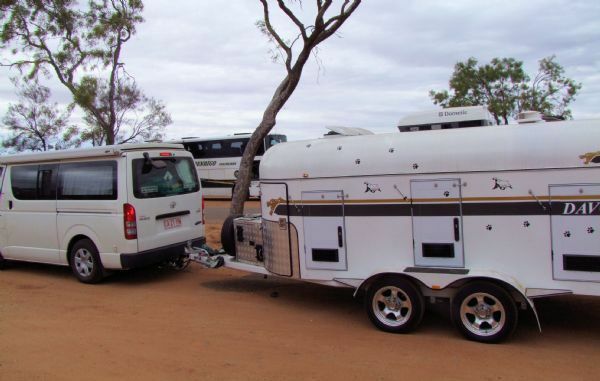 Here we have stopped at Renner Springs in Australia's Northern Territory for the night. November 2013. Setting up 'Camp Rheged' ~ with the dogs all safe & cool in their air conditioned trailer. With the 'Kosmos' Kennels Italian Greyhounds in the background! November 2013. 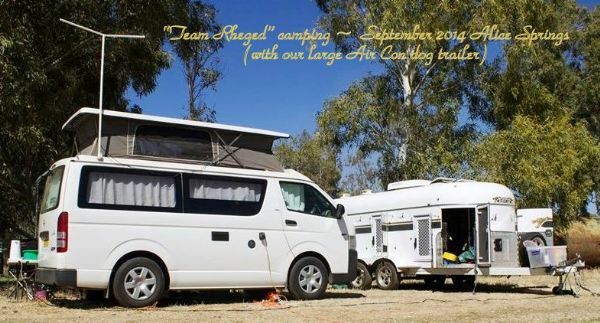 'Team Rheged' away camping & showing September 2014. We have 2 dog trailers & this, the largest one, is fully insulated, has reverse cycle Air Conditioning, internal travel lights, 'Spaniel Cam' & is powered by it's own Gen Set or mains electricity plus may other features. A truly superior trailer that we all love! Photo by Jayden Probert. 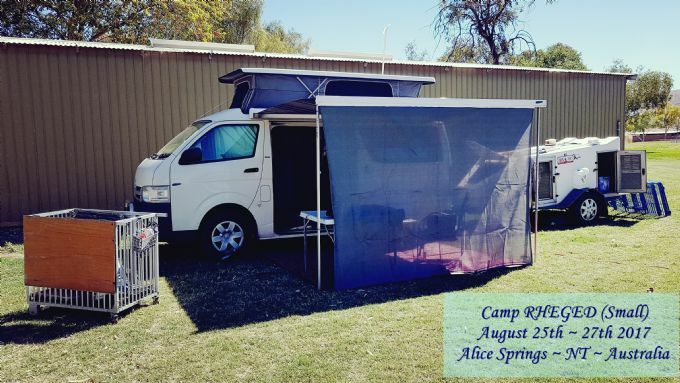 Base camp, Alice Springs, July 2016. 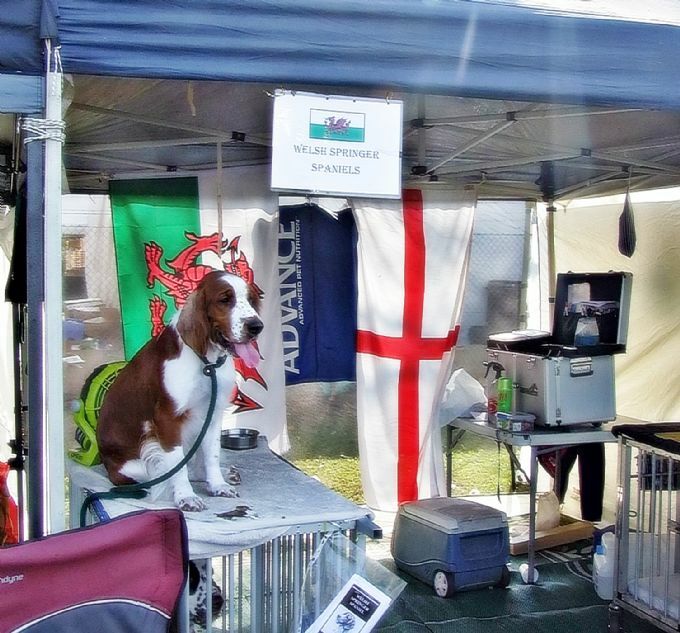 Nikki will often drive the 3,000 kms alone do the 6x July Ch Show circuit so tends to travel with less dogs. This trip she took 3 of our younger dogs ('Molly', 'Jester' & 'MeMe'). Being alone Nikki wisely opted to camp with our smaller 3x berth dog float & used shade awnings instead of our full sized heavy duty annex. 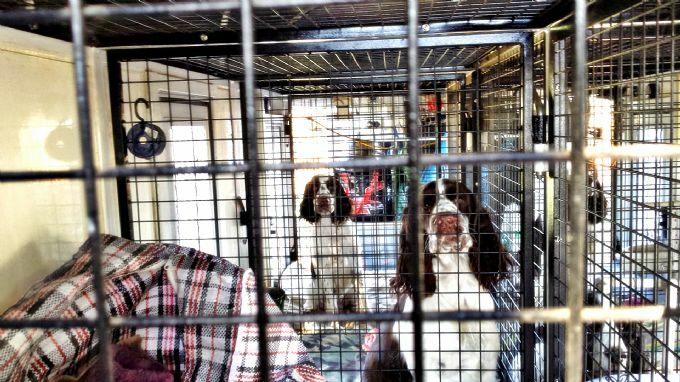 Peter, 'Molly Jones' the Welshie, & English Springers 'Pork Chops' (underneath) & 'Meazle' (on top of the trolley) busy talking to the public about the joys of being owned by Springer Spaniels! 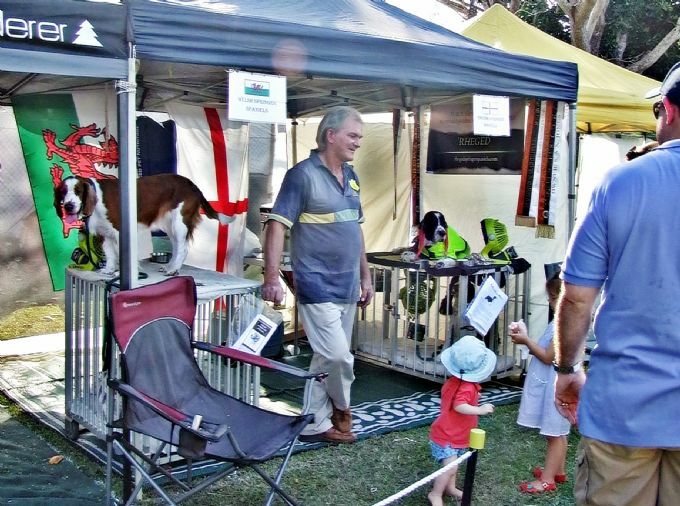 Royal Darwin Show 2016. 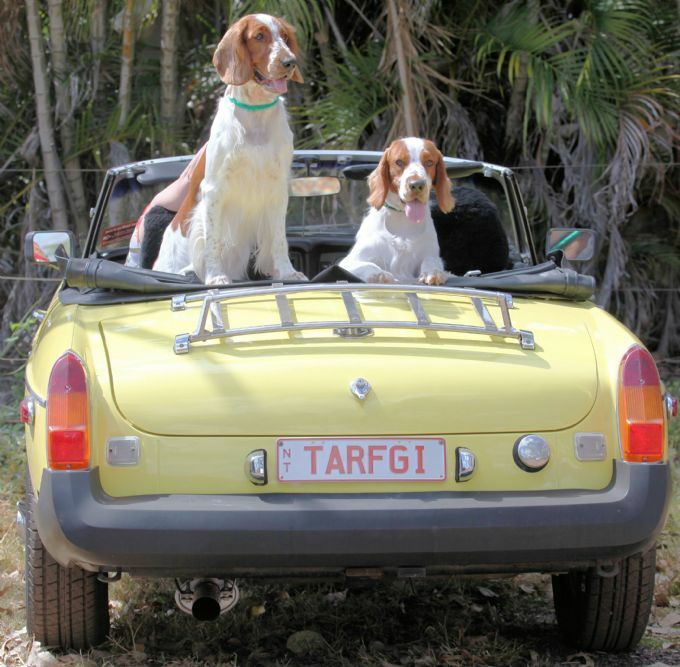 'Tally' (right - 'Supreme Champion Ricochez Auryn Talyessin CCD CD RN RE RA RAE') & 'Ruby' (left -'Champion Bethry Ruby Red Dress' owned by Chris Hawkins) ready to hit the road in Nikki's MGB named 'TARFGI' - which is the old name Welsh Springer Spaniels are sometimes known by in Wales. Camp RHEGED August 2017. 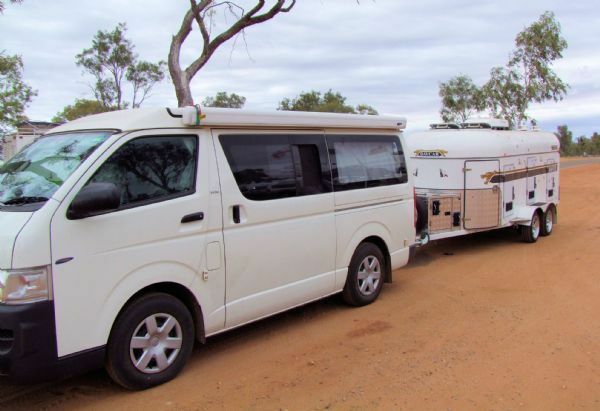 Nikki travelled the long 3000kms alone, as she often does - with just Jester & Molly to show. A super, although freezing cold weekend, with Jester being 'made up' to Champion with 3x Best of Breed & 2x Best Australian Bred in Group awards PLUS a very tidy Best Exhibit in Group win (Judge: Mr. M. Winch (Vic)! Molly was also highly awarded with 3x Best of Breed awards. 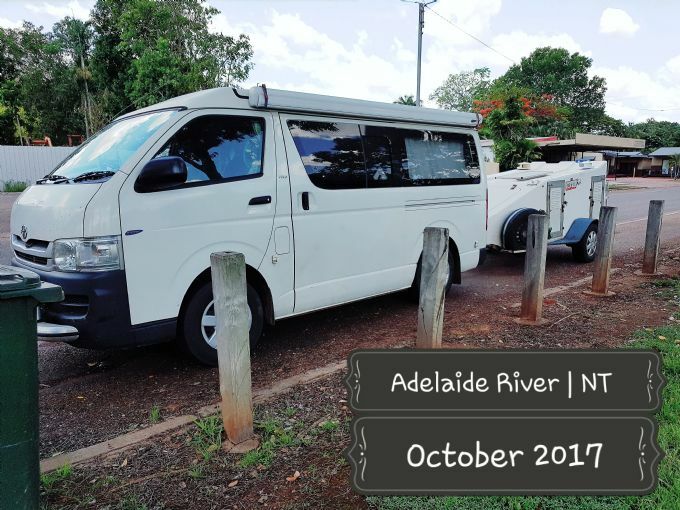 Camping out in Alice Springs, October 2017. Just Nikki, Molly & Pork Chops - a girls weekend away! Molly, the Welshie, came home with a lovely Runner Up Best Exhibit in Show award (Judge: Mr Mark Johnson - NSW), plus a Best Exhibit in Group ticket, a Best Australian Bred in Show, 4x Best of Breed CCs & 2x Best Australian Bred in Group ribbons. Porky (ESS) was awarded 4x Best Intermediate in Group sashes & 4x Best of Breed CCs! 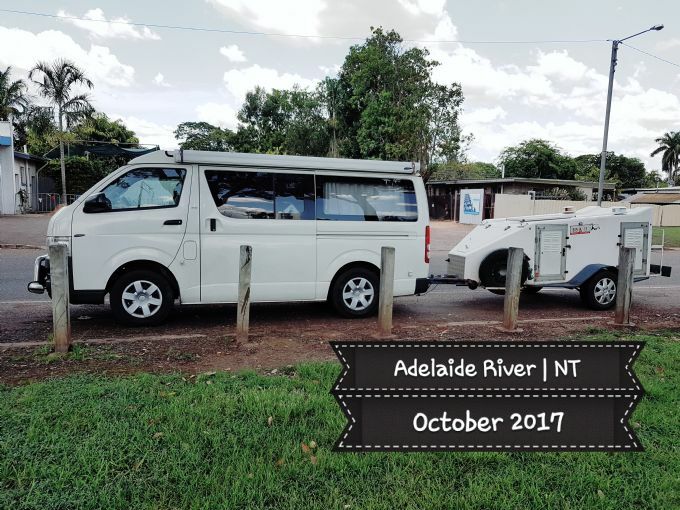 Camper Wally & the smaller dog float taking a breather at Adelaide River - nearly home after another 3000km trip to Alice Springs. October 2017. Our Springers are very well travelled & here is Molly Jones about to cross the Tropic of Capricorn - something she does, as we all do, several times a year! March 4th 2018. 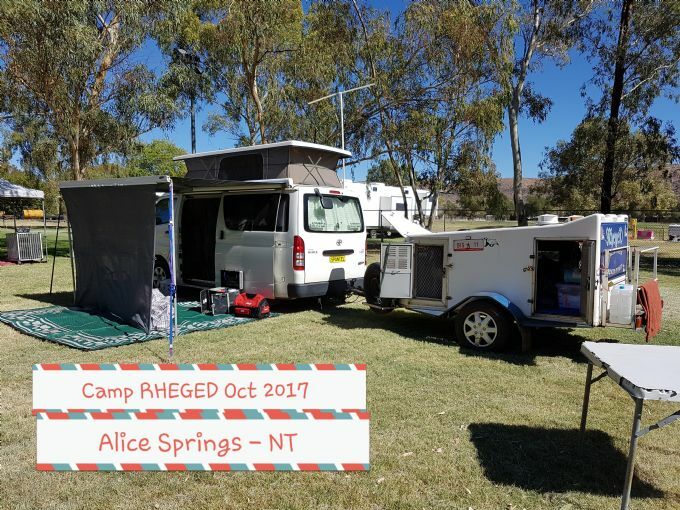 Camp RHEGED ~ Aug 2017. Nikki travelled the 3000kms alone, as she often does - with just Jester & Molly to show. A super, although cold weekend, with Jester being 'made up' to CHAMPION status with 3x Best of Breed & 2x Best Australian Bred in Group awards PLUS a very tidy Best Exhibit in Group win (Judge: Mr. M. Winch (Vic)! Molly was also highly awarded with 3x Best of Breed awards. One of our larger base camps where we had 2x cars, both the large & the smaller dog floats & 7x Springers in tow! We won 2x BEST IN GROUP & 1x BEST IN SHOW awards with Meazle & many CLASS IN GROUP ribbons! 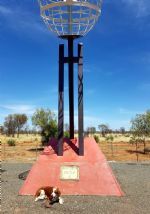 Tennant Creek Shows 2016. 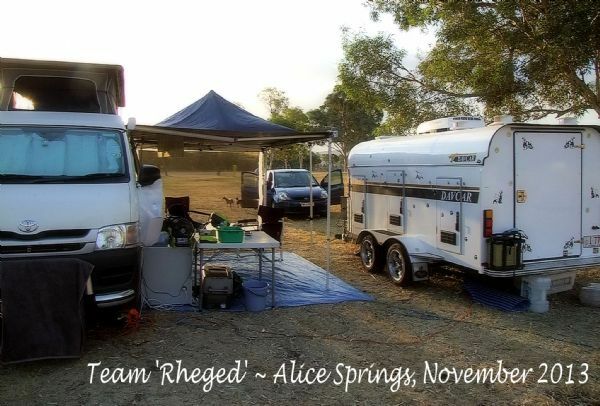 Team Rheged ~ Home away from home - our camper (named 'Wally') & the dogs Air Conditioned, Heated trailer on the road in the middle of nowhere! 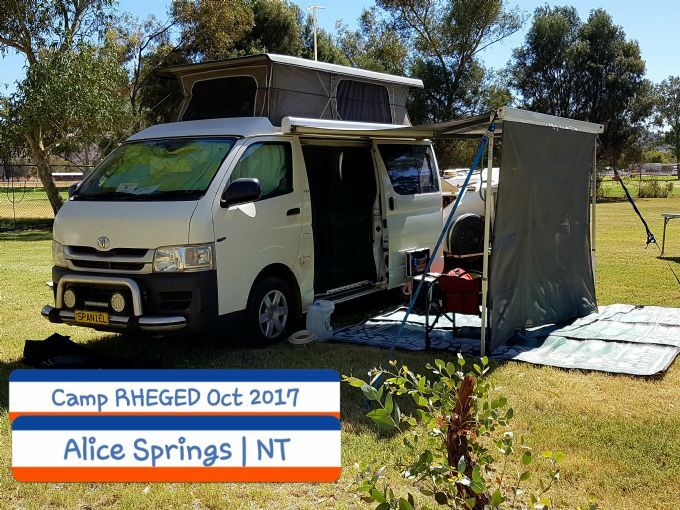 Alice Springs November 2017. 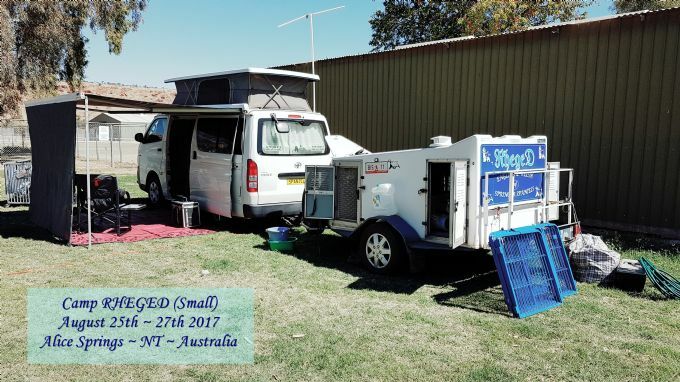 Nikki doing another solo 3000km trip with just Molly (WSS) & Porky (ESS). The dogs performed very well & 'the girls' came home with a swag of prizes including a lovely Runner Up Best Exhibit in Show sash (judge: Mr Mark Johnson - NSW), plus Best Exhibit in Group, Best Australian Bred in Show & 2x Best of Breed CCs - won by 'Molly'! 'Porky' collected 4x Best of Breed CCs & 4x Best Intermediate in Group awards. 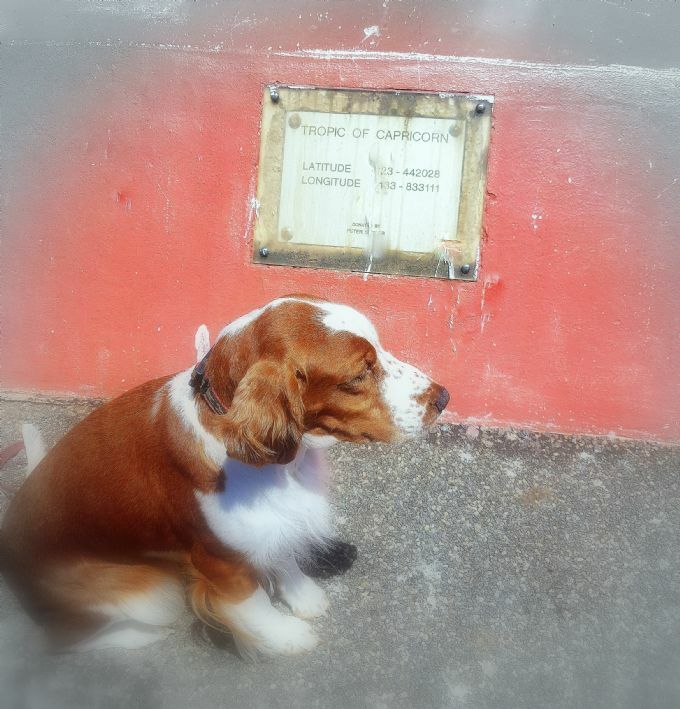 Our Springers are very well travelled & here is Molly Jones about to cross the Tropic of Capricorn - something she does several times a year! March 4th 2018. Sometimes we will take just 2 or 3 dogs away & on those occasions we may use our small trailer & as always, 'Wally' our camper with 'SPANIEL' number plates of course! Tennant Creek ~ March 2015. 'Jester' & 'MeMe' living it up in Camp Rheged, Tennant Creek, July 2016. 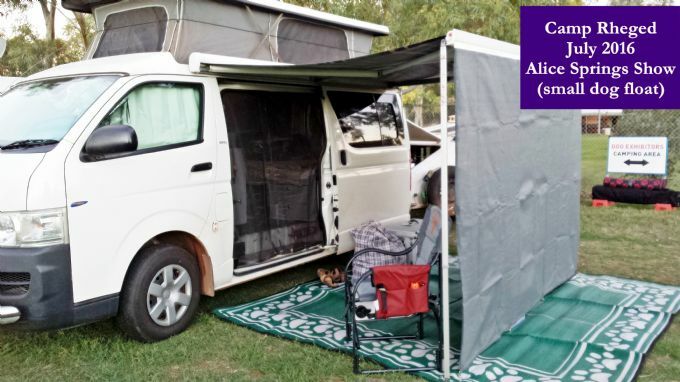 This larger 6 berth float has reverse cycle Air Conditioning & all the mod cons! 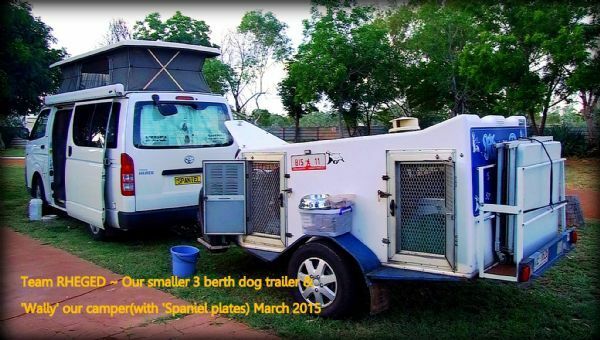 Sometimes we will take just 2 or 3 dogs away showing & on those occasions we may use our smaller trailer with it's internal fans, LED lighting & valuable 20 litre water tank all powered by the roof mounted solar panels. Tennant Creek early morning fog ~ November 2014. Photo by Jayden Probert. 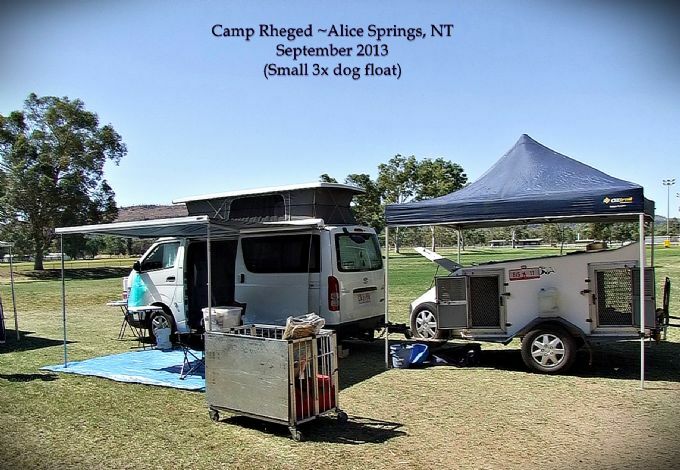 Our camper (Wally) & the dogs trailer - Team Rheged's home away from home whilst travelling.